My find of the year has been this out of print book which the Institute of Mennonite Studies published in 1981. 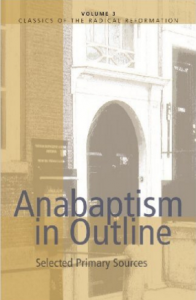 It is a printing of the actual writings of well known Anabaptists on 17 areas of doctrine. This is not an Anabaptist history. There we find that these men were born Catholic, converted by Reformers but became Baptists by studying the church and the ordinances. In these writings we read their arguments and convictions as they opposed Rome and the Reformers. These beliefs were forged in times of horrific persecution and are thrilling to read. I turned immediately to the church, baptism, communion and a section on the Bible. I must say that my heart rejoiced as I identified with these historic and biblical explanations. They are simple yet profound. They show a forthright use of the Scripture with a deep trust in its clear statements. Though these were given the name Anabaptist by their persecutors, I found my Baptist ecclesiology there, in clear unmistakable form. When Baptists later took the name themselves and wrote long confessions, these roots in church doctrine hadn’t changed. The church is defined the same and the ordinances were practiced the same. It would be good for Baptists today to read this heritage. We all have a tendency to add our own thoughts to history and become our own revisionists. These men wrote their faith so they could die for it. Would we?